Shanghai port faces an increasing shipping market. Through a series of development and construction works, Shanghai has 8 container ports that handle container vessels from all over the world. However, the continuously increasing throughput volume put a lot of pressures over the terminal operators. 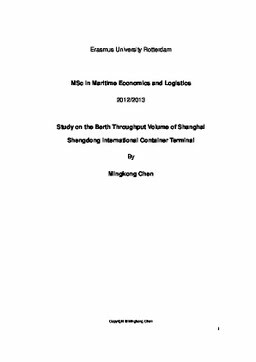 To study the relation between the throughput and the berth handling volume, the paper focuses on the biggest container terminal, SSICT and adopts a quantitative analysis to the research topic. The paper consists of 2 parts, which are the throughput forecast and the berth handling volume calculation. In the throughput forecast, the paper compares estimations of exponential smoothing model with GM (1, 1) model, then, the paper detects that GM (1, 1) produces a more accurate forecast result. Hence, the GM (1, 1) model is used by the author to forecast the throughput volume of SSICT and Shanghai Port. After the forecast, the study pays attention to the berth handling volume of SSICT. A basic introduction about the berth side operation process is given and the practical data are used in the berth handing volume. Comparing with the throughput forecast, the research concludes that SSICT needs to improve the berth productivity in the future. Finally, the paper makes sensitive analyses of the impacts which have influence on the berth handling volume. Basing on the sensitivity analysis, the author proposes some solutions to increase the berth productivity of SSICT.